Video with Karena Virginia and Music by Snatam Kaur. Produced by Sounds True. Available at Spirit Voyage, Target, Amazon, Best Buy, Barnes and Noble, Sounds True and many other locations. The Power of Kundalini Yoga sold out on Amazon on the first day – and with good reason. This video is Karena at her very best. She leads us through a 90-minute program of asana practice, guided meditation, and serene reflection in order to release the subconscious and energetic blocks to the miracles of love, health, and abundance that are everyone’s birthright. Karena presents a seven-part, customizable series of exercises and teachings focused on aligning with the forces of love and gratitude, and freeing ourselves from self-sabotaging fear and negativity. *This is a re-release and re-package of the DVD previously called Abundance and Miracles, re-mastered and all spiffed up. It will make a profound gift of transformation – for you and for your family and friends. Music by Snatam Kaur is played softly in the background throughout the entire DVD, and Karena’s wisdom is shared in every section of this amazing learning tool. It’s the kind of DVD you can play in the background while you are home to increase the vibration of your surroundings and allow the beautiful music and lessons being shared to sink deeply into your psyche. This DVD has it all! It’s perfect for yogis of all levels. Beginners will be able to practice all of the kriyas and meditations on this video, with lots of room to challenge themselves and grow. More advanced yogis will also be given the opportunity engage their bodies, improve strength and endurance and bring a beautiful sense of balance to their practice. Attracting Miracles: A beautiful talk from Karena about abundance and living from a place of ease, happiness positivity and grace. Tuning In: Detailed instructions on tuning in with the Adi Mantra, Ong Namo Guru Dev Namo. Yoga for Flowing Energy Part 1: A soothing and gentle series of warm up exercises to prepare the body and open the energy channels. Yoga for Flowing Energy Part 2: The second part of the warm up series to move energy through every part of the body, open the heart and allow you to deepen your connection to your intuition. Yoga for Abundance: A powerful, energizing yoga kriya to increase the auric field, magnetizing yourself for abundance. This kriya balances sympathetic and parasympathetic nervous system and extends the power of your projection. This kriya will challenge all levels of yogis! 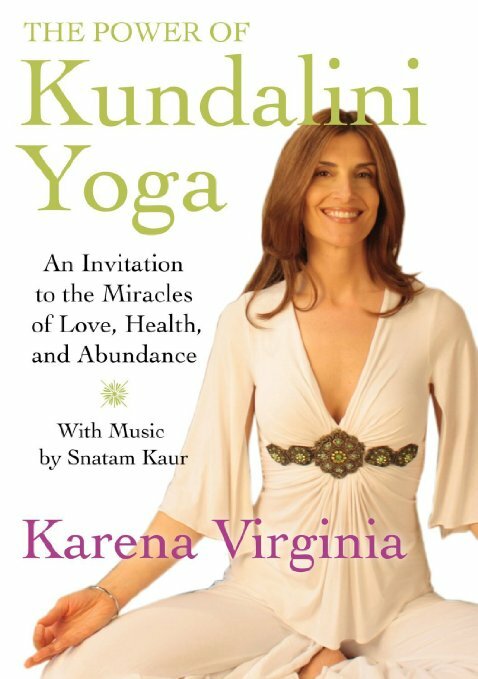 Yoga for Miracles: Karena shares her wisdom on attracting miracles into your life and teaches us a potent practice to allow us to surrender and receive the abundant blessings of the Universe. Deep Relaxation: A beautiful guided meditation to allow your body to completely relax into the deep healing space of total surrender. Guided Meditation for Gratitude: Gratitude is the most powerfully transformative emotion in the world! Karena guides us in a gorgeous meditation to allow us to experience blissful gratitude for the many blessings in our lives. A Case for Abundance: Karena shares her very personal story of heartache and loss – and how those experiences allowed her to grow, bringing blessings beyond her wildest imagination. These lessons transformed her life, and have allowed her to share the wisdom of those lessons with people all over the world. Blessings: A prayerful closing message from Karena Virginia – directly from her heart. Karena Virginia has created a beautiful tool for transformation with this incredible video. We are so honored to share it with you – may it bring an abundance of miracles into your life! Karena Virginia is a certified healer and registered yoga instructor in the Kundalini and Hatha schools for nearly 20 years. She was also recently featured in Oprah’s “Belief” Series! She is a teacher that communicates directly from her heart, and has made it her mission to show others how to do the same. She is a bright, beautiful blessing in this world and we love her dearly!